My son's perfectly soft newborn skin has been replaced with scabs, bumps, indentations and bruises. He has been poked by more IVs and blood draws than I can count, his flesh cut by scalpels. His sternum has been broken, pulled apart and a piece of him has been plucked from his chest and replaced with another child's. He's had tubes, catheters, PICC and Broviac lines inserted below his skin. I can't help but look at his mangled body and be grateful for every dark pink translucent line left on his porcelain body because each scar tells of a fight that he overcame. Without those scars, he wouldn't be here. Each morning I brush my hand over the fiery pink line that perfectly separates my son's chest. I rest my lips on healing tissue and whisper softly to him, to his heart. Surely the lines will someday fade and he won't remember how he got each mark, but I will. Each and every impression on his skin is part of his story. They are like a map, walking the reader through each tribulation that he was forced to conquer. Yes, there is the big one, both physically and figuratively, the one that ultimately gave him a second chance earth-side, but there are plenty of others that guide us through the last 158 days like a twisted treasure map. While Finn faces the potential of another physical scar to add to his collection I am trying to overcome the emotional wounds that will forever mark me from the inside. Feelings have become so complex now. I am stuck between grateful and resentful, angry and depressed yet happy and fortunate all at the same time. A mother recently told me that she would gladly take all the worry and sadness back because that would mean that her son was still with her, which sadly he is not. What perspective that gave me. As much as I hate this journey I have to be thankful for it because without it I wouldn't have Finn. If I didn't have this sorrow, this hurt, this fear, it would mean he is no longer here. 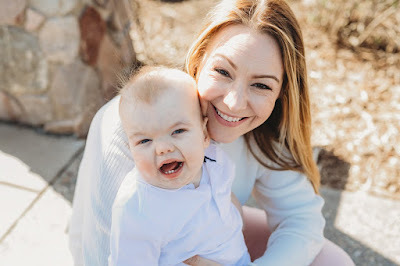 There was a point in which I was scared that my son would be teased, looked at funny or questioned for his sores. But each one tells a story of life, of hope. How he survived 78 days and three recannulations on ECMO or overcame kidney failure, twice. 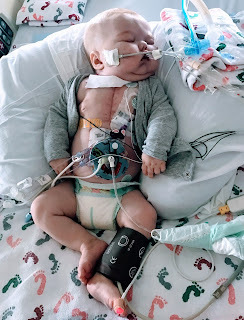 How his lung was punctured and let air flow freely into his fragile chest or the tube in his stomach that provides him breast milk directly to his intestines. On the eve of some serious conversations about the next steps in his care, I want him to know how proud I am of him and the story he wears all over his body. Of what he has defeated to be here. Although the road ahead of him is still long, I will help him continue to walk down it at whatever pace he desires. I will hold his hand through every unsteady step. Some days we will skip or run, others we will slowly crawl. Many times we will stop all together just to catch our breath.